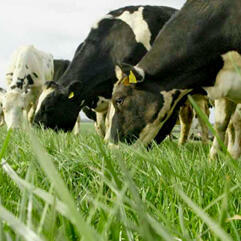 John Maher and Fergus Bogue from the Grass10 team join us to examine the current grassland situation on farm. Fergus explains that the average dairy farm on PastureBase has hit an average farm cover of 600kg DM/ha and his advice is to stop grazing immediately! Fergus explains that it is important to carry grass through the winter for spring gracing and estimates each day at grass will be worth in excess of €3 per cow in the spring. John Maher recaps on the grass situation for the year, citing that on average, dairy farms grew less than 3 tonnes of grass DM/ha which accounts for almost one cow’s grazed forage diet for the year. When asked whether some farms have stocked their farms beyond their means John said it is a case by case basis and yes some had. He explains it's a simple calculation centred around grass production, i.e. Grass growth of 14 tonne DM/ha is required across the whole farm to support a stocking rate of 2.5 cows/ha and where farms are growing less they need to take a critical look at their business.